Have you walked by your front door and are feeling this recent cold spell right through it? Are you decorating for the holidays and noticed that your front door doesn’t look so great, even dressed up for the season? It may be time to consider a new entry door for your home. A new door brings many benefits that you can both see and feel. If you feel drafts around your entry doors and you’ve already checked the weather stripping and it’s in good shape, the problem may be the door itself. Wood doors can crack or split over time. Windows in the door can lose their seals. A cheap vinyl door put in by a bargain home builder may not be energy efficient. Whatever the reason, a new entry door can make your home, especially the area right around the entry door more comfortable. If you’re looking for a very energy efficient option, consider wood or fiberglass. Although we never want to think about the security of our homes, entry doors that aren’t well made or well-installed are a major entry point for criminals. What happens when you lean into your door? If it gives, imagine what would happen if you kicked at it near the handle. Glass and vinyl doors are the least secure with steel, fiberglass, and solid wood among the more secure options. Because a new entry door isn’t the biggest investment, it is an affordable way to improve your home’s curb appeal. 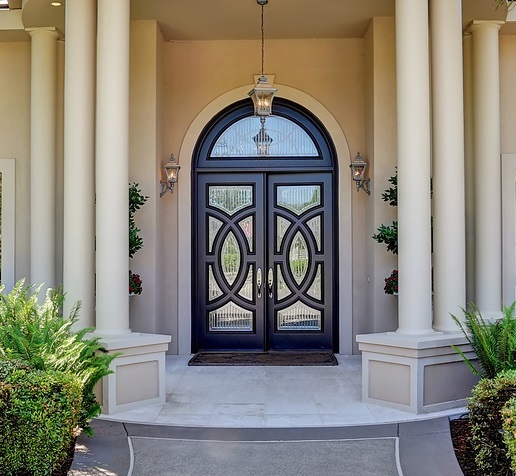 The style options of quality entry doors is virtually limitless and there are custom door companies who will make exactly what you want for your home. Depending on the material you choose, it may be able to be painted or stained so you can change the look of your front door with a quick coat of paint if you change the color of your home’s exterior. Blair Windows & Doors can help you choose the right new entry door for your home and budget. We work with many manufacturers, including custom door companies, to ensure you’ll find exactly what you want for your home. We’ll be happy to provide you with a free estimate for your new windows and doors if you give us a call at 317-356-4666 or fill out our contact form.